Phragmites australis is the dominant plant of the Mesopotamian marshes. People build their houses, fences, animal pens, floor mats and more out of this fast-growing, renewable resource. Marsh dwellers spend a lot of time harvesting and processing the reeds. This woman is heading home at dusk with a full load of the reeds. Click to enlarge. Plus, see the full photo gallery of images. EDITOR’S NOTE: In this issue, SEJournal launches a new quarterly section devoted to visual journalism — Environmental Journalism InSight. Edited by former SEJournal photo editor Roger Archibald, it will explore the whole range of photojournalism, videography, information graphics and data visualization, and how those specialties are combining more and more with traditional print reporting. Starting today with Erica Gies, contributors will share their experiences into how they’re adapting to the new concept of multimedia journalism, and provide valuable insights into helping us all do the same. Here you can read more about the article. An initiative of artist Meridel Rubenstein, environmental engineers Dr. Mark Nelson and Dr. Davide Tocchetto and Jassim al-Asadi of Nature Iraq Organization. Eden In Iraq is a humanitarian water remediation project, expressed through environmental art and wastewater garden design, which will provide urgently-needed health and clean water for southern Iraqis, their children, and future generations. The marshes in southern Iraq, formed by the Tigris and Euphrates Rivers, are thought to be a possible site of the historic Garden of Eden. Where a symbiotic, sustainable relationship once existed in the marshes balanced perfectly by healthy reeds, water buffalo trade, and rice and date cultivation, the system is now unstable. Waste has been piling up and the Euphrates River has become seriously polluted, putting the Marshlands and the Marsh Arab community at peril. There is currently no sewage treatment in the Marsh Arab towns and cities--at most, sewage is pumped into a collection site and discharged without treatment into a river or marsh. This is causing odor and damage to the long-term ecology of the marshes and the health of the community. The constructed wetland treatment will start with 7,000 square meters of reeds, which grow 1.8 meters tall. This first reed bed will immediately diminish the odor from the sewage. The wastewater will then go into the second phase of the garden: the “subsurface flow wetland.” Here, organic material of the sewage will be transformed by bacteria into mineral substances, cleaning the wastewater and simultaneously creating a beautiful and culturally significant garden by providing nutrients for plants and fruit trees, and honoring the rich Mesopotamian Marsh culture through design elements. Nature Iraq is seeking to train 12 girls and boys by experts of making traditional carpets and reed products in the central marshes. Products will be channeled through suitable marketing outlets. For the purposes of the project, Nature Iraq will connect the trainees to marketing outlets to create income for the producers to enable them to have the resources to preserve their skills and improve their products with the improvement of their production and social relations. The main proposed markets that will be focused on are Basra, Baghdad and Erbil. Nature Iraq will advertise the products on its website. Nature Iraq endeavors to protect the cultural heritage of the marsh area by documenting the skills used in making household tools. Such skills are declining in the market due to the competition of the cheap alternative products. 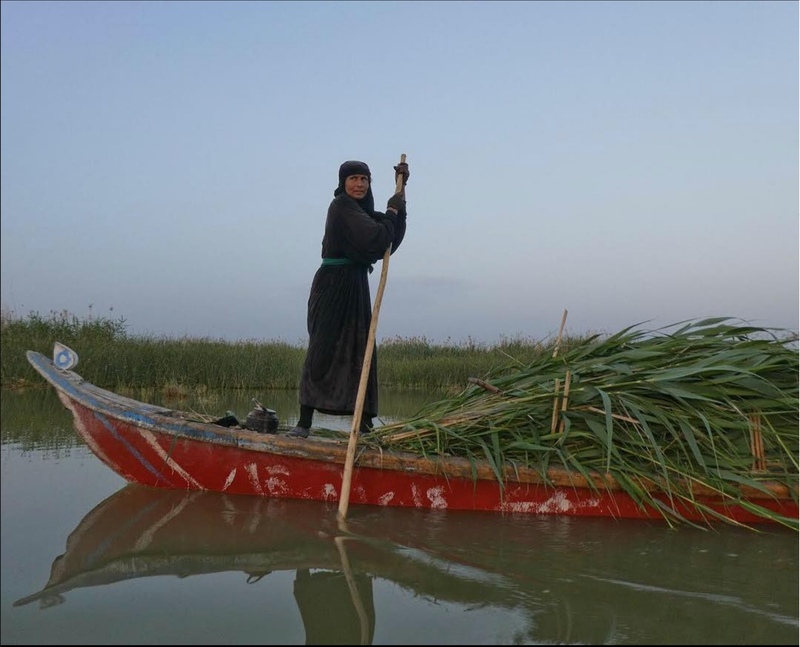 The use of such tool was the traditional way women and men in the marshes act when producing raw materials and end products that can be sold in Iraq. Such product include handmade carpets, rugs, palm leaf chairs, the traditional boats, reed rugs, reed baskets, hats, hand fans, purses, head scarfs, etc. The main goal of the project is to communicate such skills to younger generations and document them by means of the audio-visual devices and record the manufacturing process from input to the final output. The documentation materials will be edited and uploaded on Nature Iraq’s website to share them with the world. Also, Nature Iraq will train selected candidates (mostly girls) to manufacture and sell their products. Also, the organization will hold exhibitions for such products in various area of Iraq to introduce and promote them and to find suitable marketing outlets. Unfortunately, the traditional tools began to disappear fast from the market due to the availability of the cheap plastic products. Many of the things used daily in Iraq which are made of plant products began to disappear from the market and one has to travel to the remote villages to buy them. As such, the traditional skills are declining and will also disappear if nothing is done to document them. Our goal is to document these skills and revive the traditions of the area. This can be done by training young girls and boys in order to pass the knowedge to a generation or two for the preservation of the skills and traditions which managed to survive the ages. The Blue Shadows project is a year-term pilot project. It is mutually implemented between the Italian Water Rights Foundation, Friends of the Earth, Union of Municipalities of Valdarno and Valdisieve and Nature Iraq. The project aim is to river rehabilitation interventions by means of Riparian Forestation. ​​For several years, the Italian Water Rights Foundation has been mutually working with the Iraq Waterkeeper Environmental law and advocacy project of Nature Iraq serving the environment of Kurdistan Region of Iraq and enhancing capabilities of its authorities especially working with entities and certain organizations in the field of environment. They have been aiming at their role in maintaining the environment, improving the quality of life in Kurdistan Region and in benefiting from data of environmental projects implemented in Italy. It is worth mentioning that, so far, nearly 250 trainees have been benefitting from the Italian Water Rights Foundation trainings in Kurdistan Region of Iraq in addition to arrangement of several joint meetings with the Region governmental authorities and discussing available laws and regulations, suggesting change in certain laws to suit the current status of the Region. ​​Blue Shadows project is working on maintaining and improving the quality of water in Kurdistan Region of Iraq. The most outstanding recommendation was the minimization of river water evaporation level by planting trees and increasing green spaces all along rivers. ​This pilot project included five phases. At the commencement of the first phase of the project, we made preparations and started data sharing with Water Rights Foundation and Friends of the Earth through social communication, made us get together, working on such important pilot project. We believe that cooperation of the Italian government and its organizations through several projects will make us offer our best services for the environment of Kurdistan Region of Iraq and create the most suitable and healthiest life status for our coming generations and that through changing the water quality and quantity as an outstanding factor of the living environment we will. To present the project to the participants, open debate on pilot sites, what are the requirements for the project, methods of plantation, plant species suitable for the recommended areas and how to get more projects through the pilot project. Key Biodiversity Area (KBA) is a conservation term that has only come into use relatively recently, and which signifies a natural extension to the Important Bird Area (IBA) initiative, moving from conserving sites for birds to conserving sites for all taxa. Like IBAs, KBAs are areas of above-average value for wildlife, by virtue of supporting globally threatened, endemic or congregatory species, in good numbers or diversities. As with IBAs, they should be delineable and (potentially) manageable as 'protected areas'. Mike Evans is Conservation Data Manager at BirdLife International in Cambridge and was the compiler of the Important Bird Areas in the Middle East inventory in 1994. Read the report in PDF format at here. Nature Iraq, in collaboration with Komar Univeristy, the AUIS Environment Keepers, Sulaimani University, interns, and volunteers by an event have successfully celebrated the World Wildlife Day on March 3rd 2018 at Majidi Mall in Sulaymaniyah, Iraq. Here you can find more about the event. ​World Wildlife Day is on March 3rd. Nature Iraq, in collaboration with Sulaimani University, Komar Univeristy, the AUIS Environment Keepers, interns, and volunteers; will celebrate World Wildlife Day to raise awareness on the conservation of threatened animals, specifically the Persian Leopard in Iraqi Kurdistan. The event will be held at Majidi Mall in Sulaymaniyah-Iraq, on March 3rd, at 6:00-8:00 PM. Handing out an infographic brochure about the Persian Leopard and the importance of protecting this flagship species, in Kurdish language. We will distribute handmade Leopard masks on sticks for kids. Photos of people at the event will be taken with the WWD2018 action cards. The WWD posters will be distributed. The WWD2018 advocacy video as well as our Persian Leopard Conservation project video will be screened. Signatures will be collected to enforce the local government to make protected areas creation a priority, using the Leopard as a flagship species. We will post our event activities to Nature Iraq websites, Facebook, and Twitter pages. Our members are invited to attend this event. Help us celebrate this day and raise awareness on the conservation of the Persian Leopard in Kurdistan. Let's build a better future together, for us and the wildlife. ►► Download in PDF format..
​Throughout these acts and activities of advocacy project and in the beginning of the new academic year of 2017 – 2018 in Kurdistan Region of Iraq, we have undertaken a plan of distributing nearly 800 Environment Friend coloring book over several primary schools in Sulaymaniyah and Erbil. Meanwhile we have promised both our projects trainee teachers in August 2017 that in the beginning of the new academic year we will pay them a visit to provide them special drawing notebooks additional environmental instructions and awareness within our projects for students in regards to dangers on environment starting through schools up to their homes then to inside the community. This is why, on 19th November 2017, we have conducted our plan which included the distributing of Environment Friend coloring book and a set of colour pencils over Stage-2 or Stage-3 or Stage-4 students of each school. It is worth mentioning that we will sustain the plan of distributing art notebooks to the schools up to 22nd December 2017. In April 2017, we have undertaken a plan of distributing the coloring book for the first time, meanwhile upon request of several other schools, we asked the European Union which is funding our project to reprint 1000 more copies and purchase colour pencil sets for the second term. Happily, they showed consent and encouraged us to administer the enactment of Advocacy project that we have already undertaken to start the plan of printing and distributing over schools. Thankfully in Erbil, the Department of Environment of Erbil showed its cooperation in this widespread environment campaign. Iraq Water-keeper Environmental Law and advocacy project of Nature Iraq has received a letter of appreciation from the Environmental Protection and Improvement Board in KRG for the hard work on the entire process of reviewing the Instruction number (1) of 2015 in Kurdistan region of Iraq (Hunting and Conserving Wild Animals and Birds), also to thank the project staff for the other successful activities of the project (workshops, trainings, advocacy works and environmental campaigns) in cooperation of the Erbil Directorate of Environment. Diary Muhamad, EU project Coordinator. Samad Mohammed, Head of the Environmental Protection and Improvement Board in KRG. Razhan Aso, Legal Assistant of EU Project. Team of Iraq Water keeper Environmental Law and Advocacy project under Nature Iraq organization maintains a follow-up order for laws, instructions and policies of environment enacted by legislative authority; it continuously attempted to maintain the role of civil society organizations, made peoples get involved perspectives in terms of composition and writing drafts of environment laws. For this reason, we assumed organizing a joint meeting to be held in the ministry of agriculture and water resources in Erbil, on 06/12/2017, where Mr. Dr. Anwar Omar Qadir as the director-general of planning and follow-up department under ministry of agriculture and water resources, Mr. Hussein Hama Karim Rahim as general director of forests department, director of Erbil Forests, representative of board of protecting and improving the environment, representative of Erbil Department of Environment, certain legal chief and directors of sections within directorate of Erbil planning of Forests attended the meeting. In general, the meeting objective shed light on environment laws, fertilizing the laws, pinpointing weak points of laws, amending the laws to fit the ongoing status of Kurdistan Region in addition to application of a strategic plan for executing these laws prior to enactment. Establishment or assignment of an environmental court in every city of Kurdistan Region to maintain the application of environment laws. Application of a penalty order to be executed equally and generally, i.e., the violator to be fined based upon crimes type. There are several crimes composed within the policies but they have never existed in the laws. This issue has created outstanding environment situations that never been settled by courts due to unavailability of a lawful text. Improvement of systems because some of them contradict with some laws. Formally authorizing organizations to circulate awareness among countryside citizens.